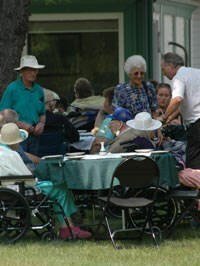 Visitors are welcome to share a meal with residents. Please notify the Dietary Department between 9:00am - 5:00pm before a meal visit if possible. Meal tickets can be purchased at Dietary and/or the front desk. It is advisable to check with the nursing staff if a visitor wishes to leave a gift of food for the resident. It may interfere with certain dietary or medical conditions. Please do not visit if you are feeling ill! All visitors are encouraged to use a hand sanitizer at the front desk before and after every visit! Frequent handwashing should also be done. Thank you for helping our residents stay healthier. Please bring a change of footwear to wear as you walk around our home. The following tips can help you feel connected to and actively involved with loved ones ensuring the relationship you have always shared continues. Encourage reminiscing: reviewing one's life can be a healthful and natural process. Old life magazines, available at many used bookstores, are a great starting point. Consider capturing these reflections on audio or video tape. Take an interest in small details: ask for a description of the small parts of the event or experience. Be patient if your loved one is slow in responding or "gets off track". Maintain honest and open communication: which includes sharing a painful life event or your bad feelings as well as your good ones. Don't try to shield the resident from what can be very meaningful exchanges between the two of you. Ask for advice: most individuals are flattered and appreciate being needed. This is a good opportunity for the resident to make a contribution to your life. Encourage the resident to choose the focus of conversation. Bring a gift or a special memento:plants, flowers, a blanket, or comfortable clothing without zippers or buttons. Bring along the family pet. Give a back rub or gentle arm and leg massage: this relieves discomfort caused by immobility and lack of exercize. Watch a movie or a special television show together. Help with phone calls or take dictation for letter writing: this builds and strengthens a support network for the resident. Arrange for a family meal together in the facility's dining room. Read aloud together: try the hometown newspaper or a favorite book or magazine. Several periodicals are published that are particular favorites of many seniors; Reader's Digest, Good Old Days, Ideals and Modern Maturity.